For some time now I’ve been carrying the following question in my mind: are American workers fully benefiting from their toil? We have had years of stagnant wage growth. At the same time, health insurance premiums have been going up faster than wages, inflation, and economic growth. It’s pretty obvious that some of what would otherwise have been wage growth is going toward premium increases. Those premium dollars go somewhere, first to insurers (or third-party administrators) and then, mostly, to health care workers. A recent NEJM Perspectives piece by Robert Kocher and Nikhil Sahni puts some numbers to this story. So, your wages may be stagnant, but those of the health care workers financed by your rapidly growing premiums have risen. Even some of the 46% of health care spending that doesn’t go directly to wages eventually makes its way into the paychecks of those who manufacture health care equipment, supplies, and devices. On the whole, the health care industry and related businesses are doing well. Most other workers are not. Certainly, workers get something for their premiums. But are they getting as much extra value each year as those premium increases imply? It is not clear to me they are. Along with the growth in cost Kocher and Sahni point to a troubling story in health care productivity. Yet unlike virtually all other sectors of the U.S. economy, health care has experienced no gains over the past 20 years in labor productivity, defined as output per worker (in health care, the “output” is the volume of activity — including all encounters, tests, treatments, and surgeries — per unit of cost). Although it is possible that some gains in quality have been achieved that are not reflected in productivity gains, it’s striking that health care is not experiencing anything near the gains achieved in other sectors. Here’s part of their chart that illustrates the productivity trends over the period 1990-2010. The full chart is here and it echos the findings of David Cutler several years ago. So, employment and wages in health care are growing, while output (procedures, tests, visits, etc.) is not keeping up. This is consistent with findings from Massachusetts that show that most health care job growth has been in administrative functions. With our growing premiums, we may be paying more and more for less and less that relates directly to health. Instead, we’re paying for behind-the-scenes coding, billing, and other administrative and management functions. To be sure, those are essential for providers to survive in today’s complex health care market. But they likely do little for patient care. The health care sector may be contributing toward boosting GDP by employing more people and at increasing wages. But, as Uwe Reinhardt suggested recently, it’s not clear the sector is increasing health or welfare (in a non-economic sense) as much as that growth would seem to imply. So, what are American workers getting for their toil? A lot less than they deserve, and some of it is consumed by negative health care productivity. From this, it appears that the health care industry is vying with the financial industry to see who can produce the most economic gain for themselves while providing the least benefit to the country. Every other developed country has managed to successfully address the problem of providing health care to their population. They all manage to provide quality health care to everyone at less than half of what the US spends to provide spotty health care to some of the population. They do this through universal access and strong regulation of the market. Unfortunately, the health care industry in the US has captured the politicians which prevents this solution. There will be no solution to this problem until the political system is reformed to eliminate the corrupting influence of money… a very difficult task. Will it take rioting in the streets like Greece? 1. 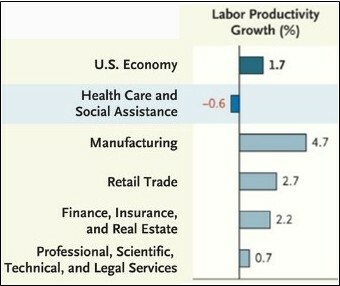 The measure of labor productivity in healthcare (keep in mind I have close to no knowledge of labor issues). It seems to me though that volume is a particularly poor measure of productivity within the world of healthcare and is, at best, incomparable to productivity in other sectors. The NEJM guys gloss over the statement, “Although it is possible that some gains in quality have been achieved that are not reflected in productivity gains” with the irrefutable, “well, no matter how you slice it it’s still crazy!” But I think one ought to step back and examine more holistically, how has healthcare delivery changed over the past 20 years relative to wage increases? The conclusion as-is seems to be, “We haven’t seen more tests per dollar spent in healthcare, therefore additional dollars have been a waste” which I’m not sure is right. 2. The quick question: Could the wage increases in healthcare be as a result of increased demand for healthcare workers, particularly relative to other sectors of the economy? Thanks as always for listening and keep up the great blogging! In some purely accounting sense of “boosting” that may be true, but in a causal sense when you consider opportunity cost, that is almost certainly not true. It would be great if you could go into the opportunity cost of current health care spending (as opposed to education spending, infrastructure spending, technology spending or more narrowly public health spending, etc.) to discuss an intuitive sense in which more spending on health care does not boost GDP but in fact is a drag on it. Do increased wages for healthcare workers really have a negative effect on the rest of us?